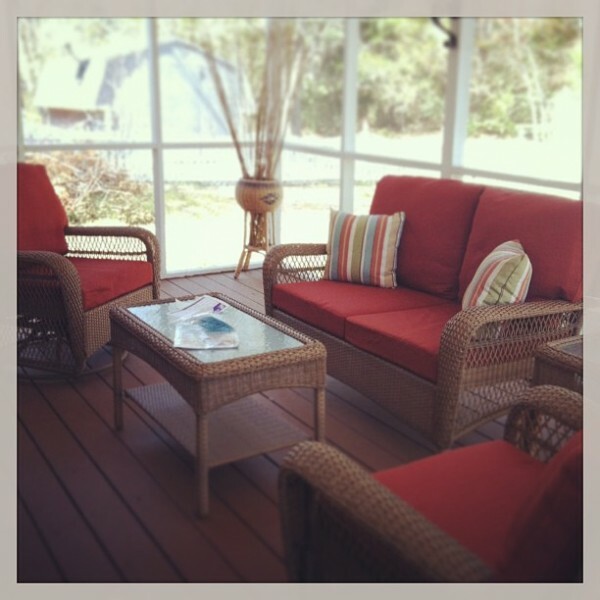 All-weather wicker furniture pieces make a lovely addition to any patio or outdoor living space. Made of resin, such pieces have the ethereal, graceful look of real wicker with the durability to stand up to Boston’s unpredictable weather. They also need very little maintenance. Unlike traditional wicker, all-weather furniture is made to be kept outside in all but the harshest conditions. That doesn’t mean, however, that you should ignore your all-weather patio furniture completely. A little TLC can extend the life of your furniture considerably and keep it looking new longer. All-weather furniture will stay nice for years with periodic cleaning with simple dish detergent and water. Use a soft brush for those hard-to-reach areas. Rinse thoroughly with a bucket of water or the hose. Never use bleach or harsh cleaners, not even a diluted bleach mixture. This can break down the resin in the furniture over time. Make sure to remove leaves and other yard debris that may get stuck in the weave of your furniture as soon as you see it. If allowed to remain, such debris can discolor your furniture pieces. Although all-weather furniture can withstand a lot, intense heat can damage it and cause it to melt. Therefore, place your chairs and tables well away from the grill and fire pit. Remove tree sap with WD-40. If you live near a grove of pine trees, you know about the sap that gets all over everything, including your outdoor furniture. One of the most effective and easiest ways to remove the sap is by spraying the area with WD-40, wiping the area with a clean rag and rinsing with the hose. All-weather doesn’t mean all season. We all know there’s a time in late October or early November that Boston residents realize they won’t be using their patios any more until spring. That’s the time to take in or store your furniture for the winter. It will last a lot longer if you keep it out of the snow, sleet and ice until April. Make sure to store the cushions indoors or somewhere dry, so they don’t mildew. Just a little regular care and a little common sense can keep your all weather furniture looking its best for years and years to come. Image by Wickerfurniture and licensed through Creative Commons.